With three tiers of mobile storage, the stainless steel cart will get you where you're going. Cart is shipped from a separate warehouse, please allow two business days for a lead time. 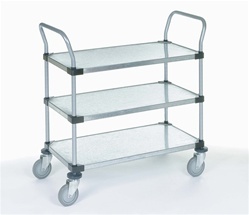 Our heavy duty Stainless Steel Utility Cart with Three Shelves will do everything you need it to, and do it well. 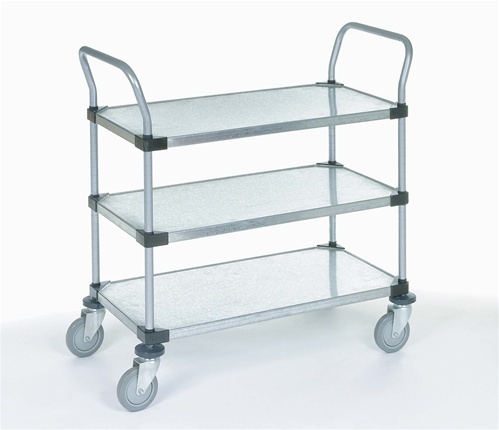 The Nexel Stainless Steel Cart is a great alternative to our Wire Shelf Utility Carts because the stainless steel guarantees protection against rust, prolonging the life of your cart in cool or moist environments. Now you can use utility carts for walk in coolers, making it perfect for restaurants. The durable steel shelves make it a good choice for heavy work, and the Polyurethane Swivel Casters make it so your cart will glide easily across any floor. Chrome Handles allow for greater control and customization, as shelves adjust at 1" increments. To add to that control, our steel cart comes with Donut Bumpers on the wheels, avoiding unnecessary damage to your workplace.